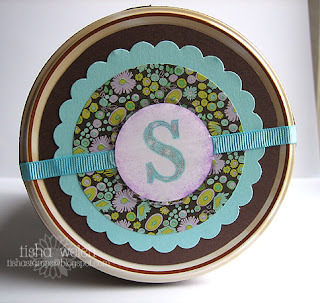 bitter sweet stamping: Happy Birthday Sarah! I am a day late in getting this posted ... but Happy Birthday to Sarah! 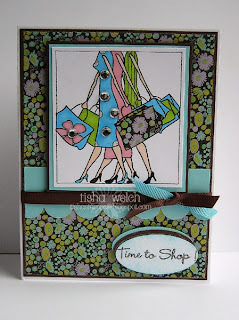 I made her this card using the MFT set Say Charge because we all went together and got her a Gift Card to the County Club Plaza (a shopping area here in KC) and we are planning a girls' night out for Thursday evening so we can take her shopping for some new duds! Yeah Girls' Night!! I also covered a can of her favorite cookies! 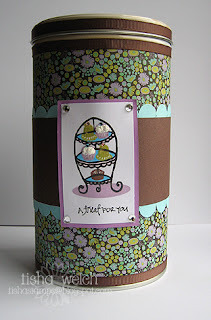 The plate stand and goodies are from one of the new A Muse clear sets - check them out here! This patterned paper came from Paper Source a while ago! I needed something bigger than 12x12 and this worked perfectly! The "S" on the top is from the A Muse Large Polka Dot Alphabet with a bit of Sakura Stardust Clear Gel Pen and a Circle Scallop Creative Candy on top! Thanks for checking in! I'm off for 12 hours of fun, fun, fun at the hospital! Have a great Monday! These are terrific...I love that DP! Those are all wonderful! I love the color combo.